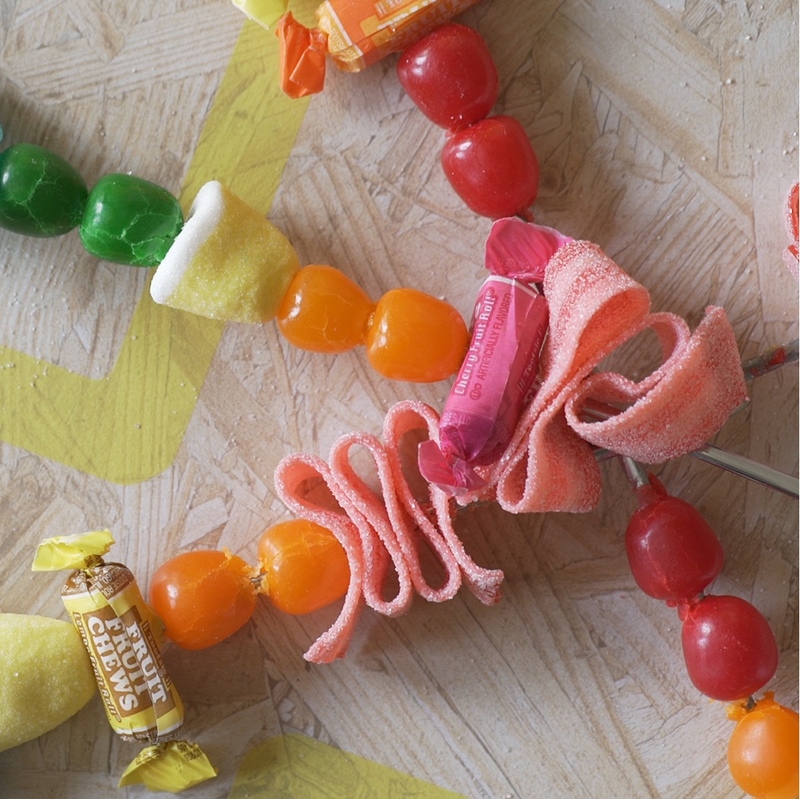 Looking for a bright colored and party perfect DIY? 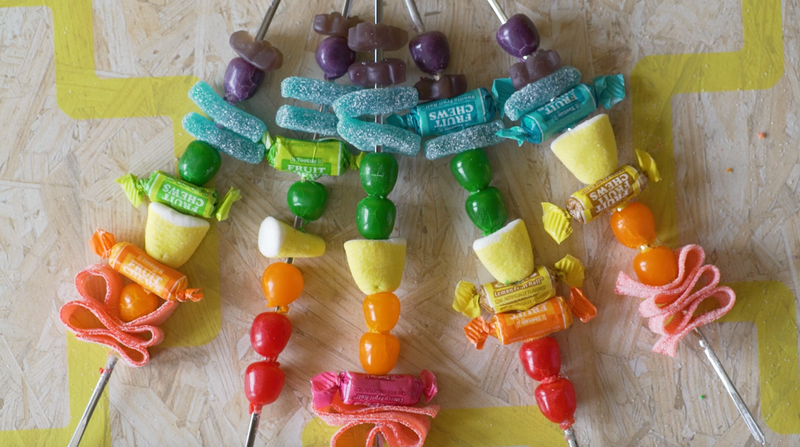 Make these happy and fun Rainbow Candy Skewers. They are perfect for a PRIDE party or a Rainbow Princess Birthday Party too. 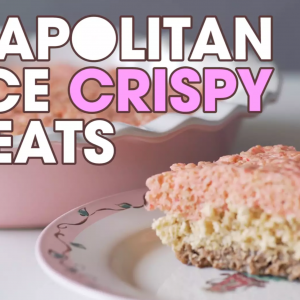 This is a no bake, no cook, 15 minute recipe. We are all about rainbows. That’s why we made these DIY Rainbow Candy Button Earrings and this Rainbow Polka Dot Bandana DIY. They are super easy to make and will fill you with so much joy! They are impossibly cute and need to be shown off at any party or gathering. 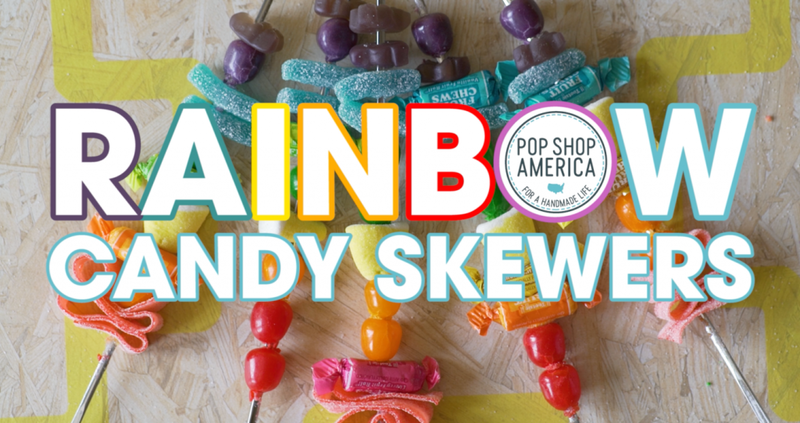 So let’s get started with this Rainbow Candy Skewers Recipe! Don’t use wooden skewers! They just aren’t strong enough. Metal works so much better because it’s sturdy and strong. Use chewy, soft, and smooshy candy! 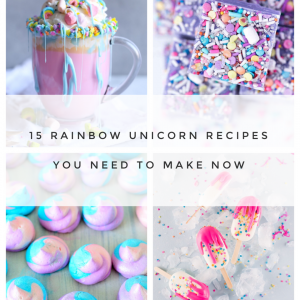 Use things like gummy bears, marshmallow bites, sours, sour belts and sour straws, flavor rolls, and more! Make sure the candy is big enough for the skewer to fit through it! Things like chewy sweet tarts and jelly bellies will be too small and won’t work. 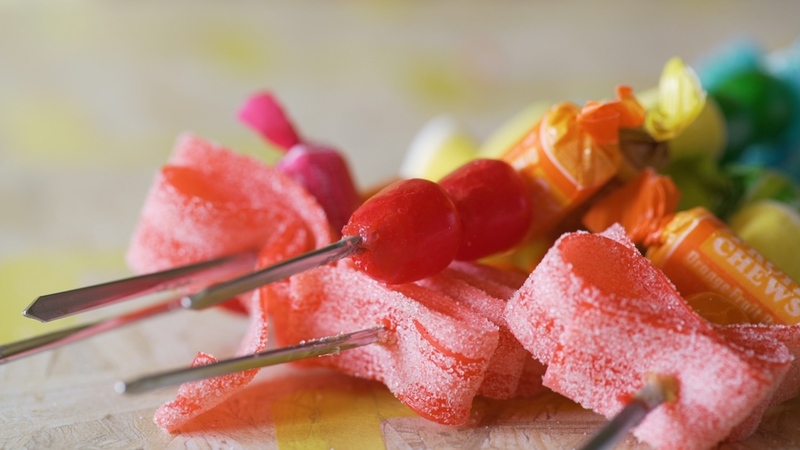 Twist the candy as you add it to the skewers. This will help prevent the candies from cracking and breaking. Go to a specialty candy store! I went to Candylicious in Houston TX for mine. A regular grocery store, even drug store won’t have the variety you need. 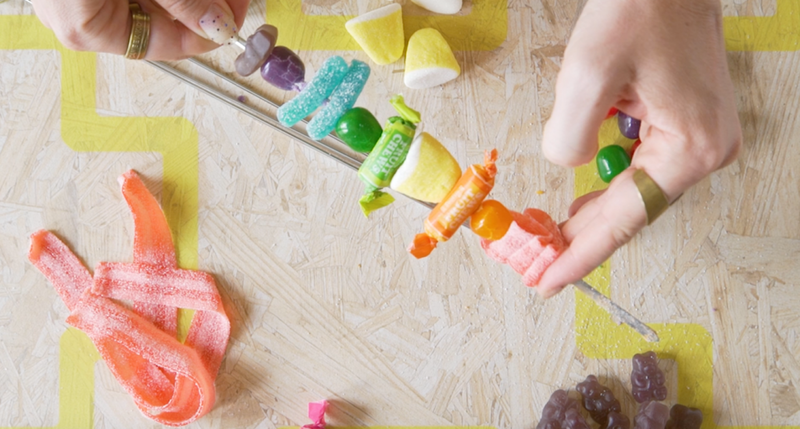 What makes these Rainbow Candy Skewers special is when there are lots of different shapes and colors! Get the smallest bags of candy you can find. If you take a look at these skewers we only used about 12 candies per skewer. You will end up with A LOT of extra candy if you aren’t careful. So look for tiny bags when picking your candy. Choose lots of different shapes. Choose ovals, flat pieces, round ones, big ones and small ones. 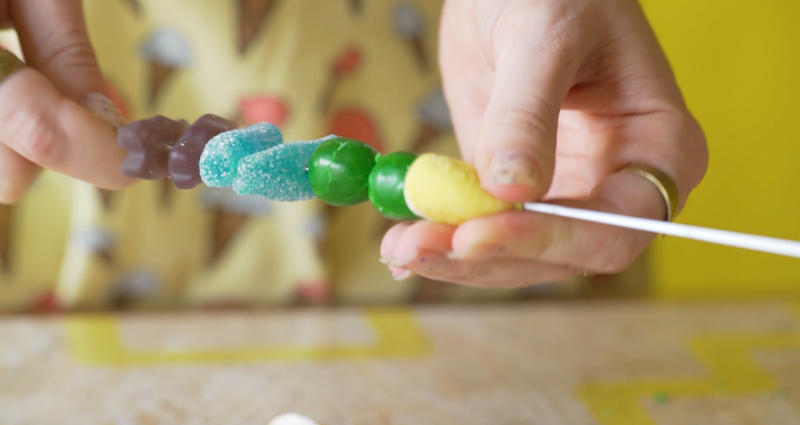 These Rainbow Candy Skewers are super fun when you use lots of different shapes and sizes. Clean the tips of the skewers before serving! Clean the tips of the skewers before serving! Let me repeat that one more time – clean the tips of the skewers before serving! 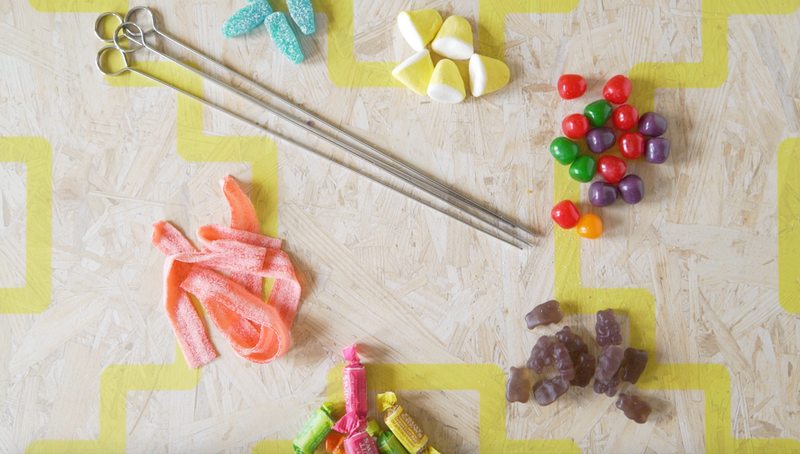 This will upgrade your candy skewers so much. There is always a bit of gummy residue from poking it onto the skewer. Wipe it down with a wet paper towel to make your finishes skewers look super professional. Just be sure to not get the candy wet. These look really fun and tasty too.